About "Manga Metamorphosis : The World Turned Upside Down! (Acts and Epistles) (#02 in Manga Books For Teens Series)"
Manga has emerged as the most popular comics category and is one of the fastest-growing genres in American publishing. Appealing to kids and adults, readers will find this edgy rendition of the early church accounts both compelling and highly engaging. This authentic, cutting-edge art style is combined with fast-paced story-telling to deliver biblical truths to an ever-changing culture that is often a challenge to penetrate. Customer Reviews For "Manga Metamorphosis : The World Turned Upside Down! 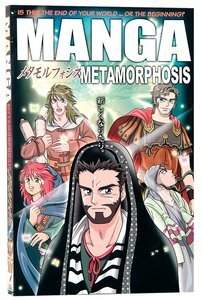 (Acts and Epistles) (#02 in Manga Books For Teens Series)"
The Manga Metamorphosis, like many others in the series of books, illustrates the stories and events that took place in the bible during the outlined time periodbooks in the bible, in particular the book of acts. The illustrations make it easier to remember what happened in the bible rather than just reading the bible, with the book, chapter and verse of the story listed below the page to encourage readers to read the bible passage. A great read even if one is not particularly fond of the Manga style. In the same way that Manga Messiah was done, the art is beautiful, the expressions wonderful, and the tears flow while reading. This is a great way to experience the book of Acts, especially for young people who like the Japanese style of cartoons/artwork.